We are the nation’s foremost motorcycle disposal company and offer a first rate service. With many years experience in vehicle disposal we can give you the peace of mind that the job will be done professionally. As we are a national company we are able to collect your unwanted motorbike from most places in the UK, and we will ensure that all of the relevant documentation is completed and sent to the authority concerned. We arrange times and locations that are convenient for our customers to collect the machines and can normally respond within hours of a call. You are just one call away from disposing of your end of life motorbike. 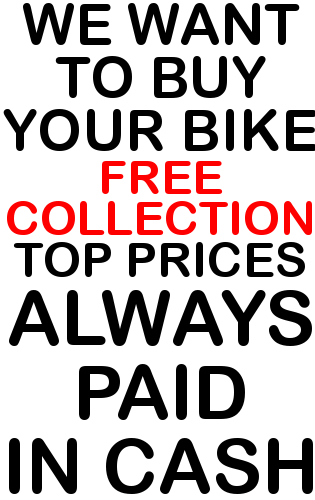 CASH IS ALWAYS PAID AND COLLECTION IS FREE - OUR MAIN COVERAGE AREA IS 30 MILES AROUND READING, LONDON AND SOUTHAMPTON. BASICALLY WE COLLECT ANYWHERE AROUND LONDON, ESSEX, BERKSHIRE, HAMPSHIRE, SURREY, OXFORDSHIRE AND SUSSEX!